Comments/Context: It is often the case that a first solo show offers us glimpses of an intriguing new artistic voice, or at least provides us with hints of promising perspectives that might (in the future) evolve into something exciting. And because we are so energized by the arrival of this splash of fresh originality, we are happily willing to live with a healthy dose of still-figuring-it-out, with the hopes that these open-ended weaknesses will be smoothed out over time, ultimately leading to strong, individual aesthetic (and conceptual) approaches that stand out from the crowd. But when an artist has his or her second gallery show, the stakes are quite a bit higher, and we as viewers are meaningfully less forgiving. Our going-in assumption is that we will see some evidence of forward progress, but more often than not, the artistic struggle continues. The difference between those that go on to build successful artistic careers and those that muddle along lies in their ability to consolidate their gains, using what they have learned in one body of work to inform and enhance the development of the next. Curran Hatleberg’s first show at Higher Pictures (in 2016, reviewed here) effectively did its job of introducing us to the photographer’s evolving vision of modern America. Undeniably working his way through the influences of a number of notable American masters, his pictures felt tantalizingly and thoughtfully in-progress. We saw plenty of visual echoes of others we admire, but also saw Hatleberg patiently and deliberately coalescing those ideas into images that were truly his own. 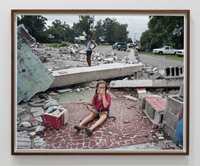 Hatleberg’s sophomore effort does just what we might have hoped – it offers direct evidence that the artist has left behind the obvious reprocessing of his predecessors and honorably moved on to a tighter and more refined vision that separates him from the many others making photographs of the modern American experience. There is a deep and pervasive sense of control here, from the meticulous floated print framing and the careful sequencing of the images on the wall, to the way Hatleberg is positioning his camera and arranging his compositions. As a result, the show feels fully resolved and ordered in a way that his first show did not, and the ratio of strong anchor pictures to supporting filler is much higher. In Hatleberg’s America, a dark undercurrent seems to percolate through life, giving the everyday a sense of quiet unease. While his pictures were taken in various states from Ohio to Texas and from Louisiana to Florida, his photographs largely strip away regional eccentricities, leaving us with places that are simultaneously everywhere and nowhere. Understated front porches, muddy creeks, outdoor tables, and dusty driveways are the setting for his attentively singular moments. Several of the best images in the show employ a deeper sense of visual depth, stretching the compositions back beyond the simplicity of something placed front and center. Untitled (Hole)creates an epic tableaux out of a small group of men digging a hole in a junkyard. The rotting carcasses of dead cars surround the scene, while towering trees arch overhead, creating dappled patterns of light on the dirt, the grave-like hole in the center drawing our attention and leaving us with an unresolved sense of anxiety. Untitled (Girl with Snake) is similarly layered. A young girl sits amid piles of jagged concrete rubble, with an African-American neighbor looking at her equally dispiriting gathering of destruction nearby. While the situation is unexplained (extreme weather? or just ordinary American decay? ), the picture has an upending twist, as the girl is inexplicably holding a snake and giggling, her hand brought up in front of her face to hide her sneaky laughter. There’s nothing funny about the cinder blocks that surround her, so the whole scene is satisfyingly pushed off-kilter. Untitled (Front Porch) has this same kind of quiet recalibration. A gaggle of barefoot boys mill around a typical American front porch, sitting on the steps, shooting the breeze, with their bikes nearby. What goes initially unnoticed in this family scene is that the young girl in the group has a prosthetic leg. Once we see that detail, the picture changes, inviting us to speculate on what tragedy might have befallen this girl. Life goes on, and the kids still play, but the quaint wholesomeness is undermined by a more complicated reality. It is these kinds of dark details that make each of Hatleberg’s photographs worth close observation, and his use of subject matter pairs creates visual rhythms that flow back and forth through the show. A menacing swarm of bees covers some deliciously juicy slices of red watermelon. This watermelon motif returns in a multi-cultural picnic scene, where the friendly mixing is interrupted by a long knife sticking out of the cut-open fruit. The bees in the first watermelon picture return in two images of a man with a beard of bees; in one, he uses both his hands to gently wipe the bees out of his eyes. This two armed gesture then echoes across the room to a man playing dominoes (his arms splayed out to his sides) and a young boy who has perhaps tossed something into the air, his arms raised in glorious anticipation of its return. The dappled light of the junkyard hole picture has its refrain in a dappled portrait of a woman and in the Divola-like polka dots painted on an abandoned house. The girl’s snake returns in an image of a different snake in the shallow water of a creek. And so on, and so on, the pictures fold back on themselves, connecting the whole series into one maturely interwoven and softly lyrical expression of the nuances of our current American reality. The strength of this show (and of the many superlative images that hold it together) removes Hatleberg from someday, up-and-comer status and cements his place as a photographic voice worth following now. A decade or more younger than Soth, Kurland, Grannan, and others who have taken up the active mantle of American photography, with well-crafted images like those on view here, he’s methodically proving that he’s ready to join the conversation.